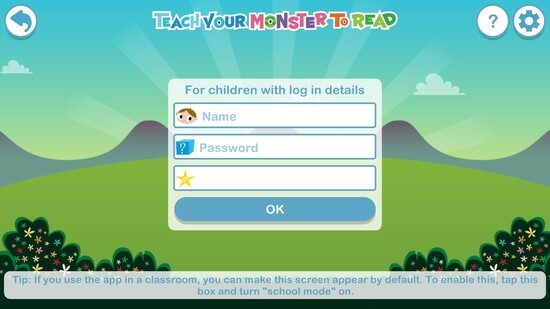 The Teach Your Monster to Read app app has a login mode for players that you create in your teacher account. You can give your students their own player logins and your players can use these login credentials to log in to the app on any device, even when they're at home. 1. Create a FREE teacher account. If you don't have one already, create a FREE teacher account on our website. 2. Create your players. Each player will be given a player name and player password (use these player login credentials to log in on the app). You will only need a Star Code if you have switched off player passwords or created editable passwords in your account settings. You can find your Star Code on your my_account page. 3. Print player password cards for your students. You can get these from your my_account page on our website after you sign up for a user account. Print 2 copies (one for school and one for them to take home). 4. Download the app. Download the app to all the devices your children use. 5. Login on the app. Open the app and press the login button. Each child can use their player login details to play. Already got a teacher account? Login to get your player names and passwords or create a new teacher account.